If you were seriously injured in a trip and fall accident in the Florida Keys, then you will likely seek out the best Florida Keys trip and fall lawyer you can find. Trip and fall accidents are often difficult to make a claim on because insurance companies will usually blame you for failing to see an open and obvious danger and therefore the accident is your fault. That is why you need to carefully select the best trip and fall attorney for your Florida Keys trip and fall accident and injury. At the Wolfson Law Firm, our Florida Keys trip and fall lawyers have helped injured trip and fall victims for more than 55 years. We are available to help you too. Simply call us at (305) 285-1115 for your free consultation. Our bilingual personal injury legal team is standing by right now to speak with you. According to the NSC (the National Safety Council), around 8.9 million ER visits every year are as a result of injuries that were sustained during a fall. Some of these falls can be very minor, only leaving a few bumps and bruises, but 8.9 million is a large number of people who suffer more serious injuries due to these falls. A lot of these accidents are preventable. Yet these accidents are often caused by the negligence of another person or corporation. 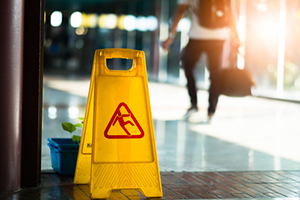 These are just a few of the common reasons as to how a person can have a trip and fall accident that may be caused by the property owner’s negligence. Serious injuries can occur due to trip and falls. One type of injuries are sprains and fractures. These are usually not fatal but sometimes can lead to significant damage that can cause complications, such as an infection or loss of mobility. Falls can cause injuries to the shoulder, which can lead to the tear in the muscle, or fractures to the bones in that area. Hip injuries in most of the cases occur because of a fall. As a person gets older, these types of falls can be disastrous. There are also back and spinal cord injuries and head injuries. These types of injuries can be very serious, causing lasting and sometimes permanent damage. Injuries like the ones obtained during falls can be disastrous for you and your family. If the injuries are serious enough, this can cause financial ruin for the victims and their family. This can be a stressful enough situation for you to deal with, you do not need to be overwhelmed by handling everything yourself. Our team of professionals have the knowledge and experience that can help you get the compensation you deserve. As Florida Keys accident attorneys, we can help to investigate your claim to see if the injury occurred because of the negligence of a person or company. We take a close look at the circumstances surrounding your fall. From there, we evaluate whether this was preventable negligence on the behalf of the property owner. If it is, we will then start working for you as your Florida Keys personal injury attorney to compile evidence of this negligence while also looking at your injuries to see what compensation is appropriate for your injuries. Our Florida Keys trip and fall accident lawyers are available to represent injured victims who live in the Keys or were visiting the Keys at the time of their trip and fall injury. We will handle your case on a contingency basis meaning we will never charge a fee unless we make a financial recovery for you. Call us now for your free and confidential consultation at (305) 285-1115.